In years past I grew my cucumbers on the ground. As they sprawled across the garden, they encroached into the other vegetables and were difficult to harvest. They would hide underneath the leaves and I would accidentally step on them. Occasionally, one would evade my search and grow to an over-mature giant draining plant energy that could have gone into others. That is all over. Trellises have brought this unruly jungle under control. 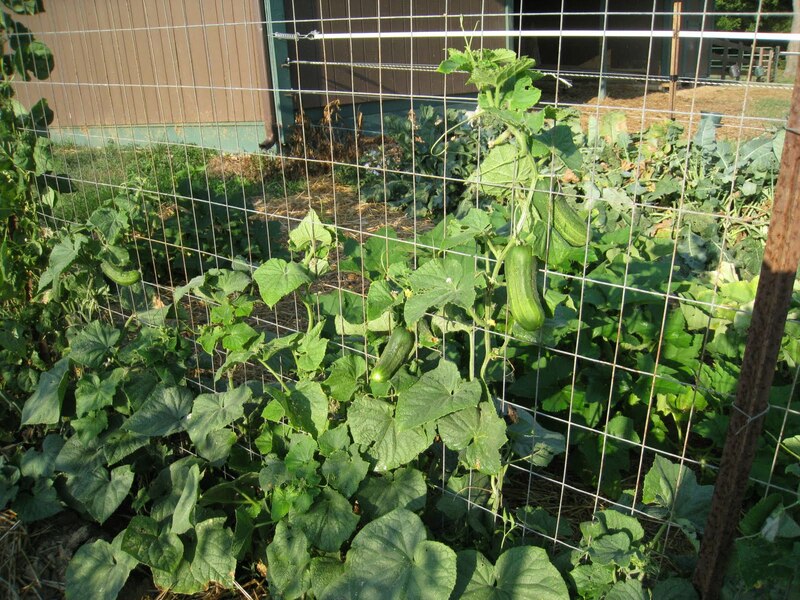 As my plants climb the trellis, the cucumbers hang down in plain sight. A few still hide under the bottom leaves, but I know right where to find them. Garden space is conserved as the plants grow towards the sun instead of the other vegetables. I do have to train the vines a bit. But that is just a small matter of taking an errant vine and weaving the end into the trellis. They learn pretty quickly. This year I have grown peas, pole beans, cucumbers and tomatoes on the trellises and I just love the system.